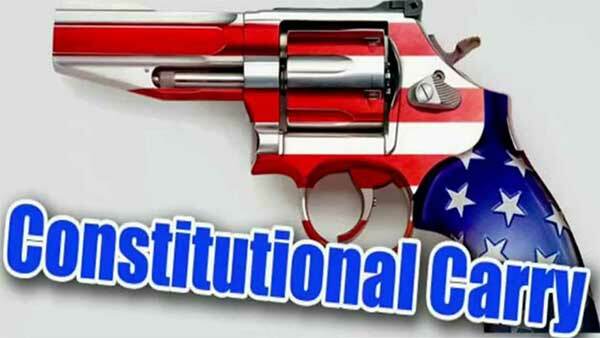 Constitutional Carry law is sweeping the country! In Georgia, Constitutional Carry was the second bill filed this year and is the hottest issue in state politics! In Oklahoma, Constitutional Carry passed the House Public Safety Committee last Thursday with almost unanimous support and is going to be heard on the floor soon! In Ohio, Constitutional Carry is about to be filed and has a whopping 28 cosponsors! In South Dakota, Constitutional Carry was passed into law two weeks ago, and was the first bill that Governor Noem ever signed! And, of course, fourteen other states already have Constitutional Carry law on the books — an incredible 28% of the country! Iowa was one of the last states in the country to pass ‘Shall Issue’ legislation. And we were one of the last states in the country to pass Stand-Your-Ground law of the states that are likely to do so. I don’t know about you, but I think it’s high time that Iowa lawmakers fight for gun owners like lawmakers and Governors in these other states have done. As you know, that fight is heating up in the Iowa Senate where Senate File 165 already has a solid 15 cosponsors and will be heard in a Senate Sub-Committee this coming Monday. But in the House, we are facing an uphill battle. As you may have heard in previous emails or in a video update, Speaker Pro-Tem Matt Windshitl refused to cosponsor our bill in the House! More than that, other lawmakers have told us that they would like to cosponsor the bill but are being scared off of it by Rep. Windshitl. Of course, this is the same Rep. Windshitl who worked to kill Constitutional Carry in 2018 and pulled it from consideration in the House in 2017! More than that, he’s expressed a willingness to advance ‘Red Flag Gun Seizure’ legislation on Iowa Press, told the Des Moines Register he was open to banning bump stocks, and tried to strip the immunity language from Stand-Your-Ground law in 2017! Now he’s actively blocking advancement of this bill in the House. Over the last two weeks I’ve left 2-3 notes with Rep. Windshitl’s pal, Rep. Jarad Klein, who chairs the House Public Safety Committee, asking for a sub-committee for Constitutional Carry in the House. Klein arrogantly refuses to even talk about this bill, sending his staffer out instead to tell me that he’s (Klein) too busy and will get back to me if he wants to. I don’t know about you, but I’m sick and tired of Rep. Windshitl holding back the bill that tens of thousands of Iowans have been pushing for for years! If you agree, please take action today, so that we can jump-start Constitutional Carry law in the House. law, like lawmakers all over the country are doing! telling him to move H.F. 118 through the process, by scheduling a sub-committee. pressure on the Iowa House, insisting that they fight for gun owners! Iowans have fought like dogs to replace anti-gun lawmakers who have opposed Constitutional Carry law over the years, flipping the Iowa House, Senate, and Governor’s mansion! Now it’s time that lawmakers in Des Moines fight for us! That’s happening right now in the Senate, with certain Senators anyway. It’s time the House does their job, too. Please send your emails right away. And remember, if you can join us in the Capitol on Monday, we’d love to have you! P.S. With Constitutional Carry sweeping across the country, law in fourteen states, and moving in 3 more right now, it’s time Iowa lawmakers fight for us and move the bill in Des Moines! Our biggest hangup is in the House, as you’ll see above! Please send your State Representative this PRE-WRITTEN EMAIL immediately, telling him/her to start fighting to advance this bill in the Iowa House! Then, please join Iowa Gun Owners right away! If you’re already a member, please consider a generous donation to help us crank up the heat in Des Moines! Now is the time!